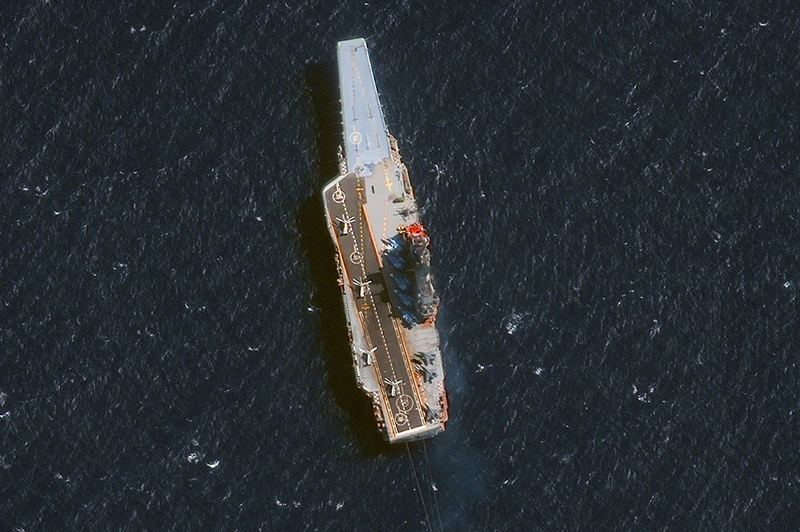 DigitalGlobe's Satellite imagery of Russia's aircraft carrier, Admiral Kuznetsov, in the Alboran Sea just off the coast of Morocco, west of the Straight of Gilbraltar, on Oct. 28. Russia’s aircraft carrier, the Admiral Kuznetsov, has now made its way to the eastern Mediterranean to participate in the country’s operations in Syria, but it isn’t the only member of the Northern and Black Sea fleets involved in the strikes. Some of Russia’s most impressive weaponry is on display off the coast of Syria. On Nov. 15, Russia’s armed forces began large-scale strikes against ISIS and Al-Nusra Front positions in Syria. The operation is being carried out mostly from sea, by weaponry aboard the Admiral Grigorovich frigate and the Admiral Kuznetsov aircraft carrier, which is being used in combat for the first time. Both ships belong to the Northern Fleet's aircraft group, which began its campaign in the northeast regions of the Atlantic and the Mediterranean Sea on Oct. 15. It reached positions in the eastern part of the Mediterranean southeast of Cyprus on Nov. 4. Since Nov. 12, the ships have been maneuvering along the Syrian coast. The Northern Fleet aircraft group includes the Peter the Great heavy nuclear missile cruiser, the Severomorsk and Vice Admiral Kulakov large anti-submarine ships and supply vessels. The Admiral Grigorovich and its accompanying tugboat are part of the Black Sea Fleet, but are cooperating with the ships of the Northern Fleet. According to the British daily The Times, the group also includes two Project 971 "Schuka-B" (Akula-class) submarines and one Project 636 "Varshavyanka" (Kilo-class) submarine. The Russian Defense Ministry has not verified this information. The Admiral Grigorivich has already launched Kalibr missiles into Syria. These winged missiles are also carried by the Varshavyanka and Schuka submarines. Additionally, the subs can launch Kalibr-PL system missiles from their torpedo installations at a distance of up to 930 miles. The Peter the Great cruiser also has 20 Granit missiles. Russia’s submarine fleet carried out its first-ever missile strike on an enemy target using winged missiles last December, when the B-237 Rostov-on-Don submarine launched Kalibr-PL system missiles from the eastern Mediterranean against ISIS targets in Raqqa Province. The Peter the Great is equipped with two RPK-6M 533-mm anti-submarine missile-torpedo systems as well as the Ka-27PL anti-submarine helicopter for fighting enemy submarines at a distance of up to 37 miles. This helicopter, which flies at a speed of up to 46 miles per hour, is capable of detecting and tracking submarines navigating at a depth of 1,600 feet. The Project 1155 Severomorsk and Vice Admiral Kulakov also guard the Russian Navy attack unit and can detect submarines. They are equipped with the Polin hydroacoustic system, which is capable of detecting enemy submarines at a distance of 30 miles. The ships' anti-submarine weapons are part of the Rastrub-B universal missile system, which can strike both ships and submarines. The ships also carry two Ka-27PL helicopters each. The arrival of the Admiral Kuzentsov has the potential to change the dynamic of Russia’s operations in Syria. The aircraft carrier possesses a significant amount of firepower on its own, and hosts jets and helicopters with additional capabilities. The Admiral Kuznetsov’s defense system includes the P-700 Granit missile system with 12 launching installations. These are the most powerful winged missiles available to the ships currently in the Mediterranean. They have a striking range of more than 370 miles. It also has eight Kortik anti-aircraft missile and gun systems (256 missiles), six AK-630 naval artillery installations and four Kinzhal sea-based anti-aircraft missile systems (192 missiles). These systems help the Kuznetsov control the airspace over the Russian naval unit as well as coastal objects. The cruiser is also equipped with 60 Udav-1 rocket-propelled depth charges for protection against torpedoes. In addition to its missile capabilities, the Admiral Kuznetsov can carry 26 Su-33 and MiG-29K/KUB planes, as well as 24 Ka-27 and Ka-31 helicopters. In this campaign, the cruiser is carrying eight MiGs. MiG-29K aircraft can carry KAB-200 bombs (including those with GLONASS positioning capabilities) as well as H-35 anti-ship missiles. The Russian Navy has tightened its operations following a Nov. 9 incident in the eastern Mediterranean. On that day, the naval group detected a Dutch Navy submarine (assumed to be a walrus-class) that was attempting to track the Russian unit. The Severomorsk and Vice-Admiral Kulakov took the bearings of the submarine at a distance of 12 miles with the help of their hydroacoustic systems and the Ka-27PL anti-submarine helicopters. Russian Defense Ministry Spokesman Igor Konashenkov said that although the submarine tried to maneuver its way around the Russian naval unit, the ships managed to establish stable hydroacoustic contact with it. For more than an hour, the ships followed its maneuvering and forced it to leave the area where the Russian aircraft group was located. This was not the first time the Russian Navy aircraft group had detected NATO submarines as it navigated the Mediterranean Sea. The U.S.S. Virginia submarine had been identified tracking the Russian ships. Editor-in-chief of Arsenal Otechestva (Arsenal of the Fatherland) magazine Victor Murakhovsky told RBTH that using the Bastions in combat is an attempt to promote these new weapons on the foreign market. "Unlike the Americans, we do not conduct constant combat activities abroad. Until recently, we were practically incapable of supplying potential buyers with statistics on the technology's combat use and effectiveness. The information was based on tests carried out in firing ranges and our own conclusions. But here we have factual information with documenting photos and video," added the expert. Dmitry Safonov, a military correspondent for Russian daily Izvestia, said that the aircraft group's strike was carried out a week after its arrival in Syria and a day after the first telephone conversation between Russian President Vladimir Putin and U.S. President-Elect Donald Trump. "We were waiting for the American elections to finish and for almost a month were not doing anything: there were humanitarian corridors, a moratorium on strikes, etc. It is very possible that we coordinated our actions with Washington in order to come out of the crisis in our relations," Safonov said.